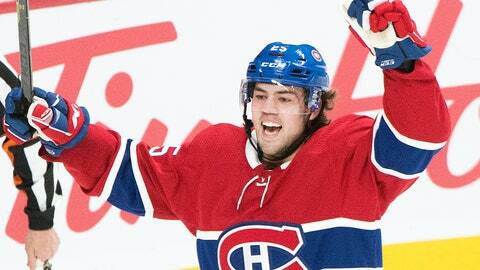 MONTREAL (AP) — Ryan Poehling delivered one of the most impressive NHL debuts in Canadiens history, giving fans plenty to cheer one night after Montreal was eliminated from playoff contention. The American-born Poehling recorded a hat trick and added the shootout winner in his debut as the Canadiens beat the Toronto Maple Leafs 6-5 Saturday in the regular-season finale for both teams. Poehling scored the shootout winner on Montreal’s fourth shot, after John Tavares failed to win it for Toronto. The American-born Poehling, Montreal’s first pick (25th overall) in the 2017 draft, recently completed his third NCAA season at St. Cloud State. Poehling, who signed three-year entry-level deal last Sunday, became the fifth Canadiens player in franchise history to score at least two goals in his NHL debut. He’s the first to do it since John Ferguson in 1963, and the first to record a hat trick since Alex Smart in 1943. Jordan Weal and Andrew Shaw also scored for the Canadiens (44-30-8). “It was all joy on the bench,” said Shaw. “We’re all happy for him, smiling. When you see a kid coming like that, honestly can’t believe it. He had a couple other opportunities as well, finished his checks. He played hard. He deserves it. He’s going to be a great player. Goalie Charlie Lindgren, in his first game of the season, stopped 44 of 49 shots. Lindgren filled in for Carey Price, who had started the previous 13 games. Price ended the season with a 35-24-6 record and a .918 save percentage. Zach Hyman, Jake Gardiner, Trevor Moore, William Nylander and Kasperi Kapanen scored for the Maple Leafs (46-28-8), who will face the Boston Bruins in the first round of the playoffs. Frederik Andersen stopped 44 of 49 shots. The shots were 49-49 after overtime — a Canadiens’ record for combined shots in a game. Montreal became the last team eliminated from playoff contention on Friday when the Columbus Blue Jackets beat the New York Rangers 3-2 in a shootout. The Canadiens have missed the playoffs in back-to-back seasons for the first time since 2001. Toronto jumped to a 2-0 lead in the first period. Hyman’s no-look shot went off Shea Weber’s skate and into the net at 5:50. Gardiner’s shot from the point was deflected by Brendan Gallagher at 8:03. Poehling scored his first NHL goal on his fourth shift, at 11:41, going hard to the net and ramming the puck past Andersen. Poehling, a native of Lakeville, Minnesota, scored his second of the game to make it 2-2 on an easy tap-in at 2:56 of the second period. Montreal grabbed its first lead of the game when Weal scored a power-play goal at 7:04 of the second. Toronto tied it less than two minutes later on Moore’s second of the season on a partial breakaway. Shaw gave the Canadiens a 4-3 lead when he completed a give-and-go with Max Domi and Artturi Lehkonen at 10:17. Nylander made it 4-4 at 17:33 of the second on a wraparound after Lindgren overcommitted to his left. With 11:56 left to play in a 4-4 game, the Leafs broke the deadlock when Auston Matthews found Kapanen alone in the slot for the winner. Poehling completed his hat trick with 2:31 left. NOTES: With an eye toward the playoffs, Toronto rested four of its top defensemen: Ron Hainsey, Jake Muzzin, Nikita Zaitsev and Travis Dermott. … Legendary broadcaster Bob Cole called his final game after a 50-year career. . Canadiens defenseman Paul Byron was out with a wrist injury. . The Canadiens will clean out their lockers on Tuesday. Maple Leafs: Will face the Boston Bruins in first round of the playoffs.